Hershey’s had what could have been a huge hit on its hands with Kissables– but an unfortunate decision to cheapen the product led to its demise. Hershey’s Kisses have been an American classic since 1907. So it’s no surprise that Hershey’s would want to leverage the success of Kisses with the 2005 introduction of Hershey’s Kissables. 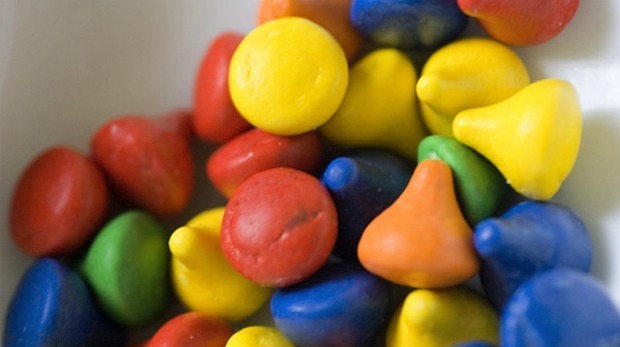 These colorful candy-coated mini-Kisses (no foil necessary) were perfectly sized to compete head-to-head with M&M’s. With a thick sugar shell in basic bright colors like red, orange, green, blue, and yellow, Kissables candy-coated milk chocolate seemed to be a hit. Then in 2007 a cost-cutting reformulation faux pas took place, resulting in Kissables’ discontinuation in July 2009. 1. Flattery Will Get You Nowhere – They say that imitation is the greatest form of flattery, but not when it comes to most new products. Unless you are bringing something truly different, better, or new to the table, having a knockoff product is not the best innovation strategy if you want to be a category leader. 3. Taste – People tend to be very picky about their chocolate and can usually tell when something tastes different or “off.” There didn’t appear to be anything wrong with the original Kissables, after all, it was the same Kisses chocolate recipe, just made smaller and covered with a candy shell. Consumers can tell the difference when a product changes, especially when it comes to something as beloved as chocolate. Changing the taste midstream seemed to be the “kiss of death” for this candy. So what can we learn from Kissables? 1) Taste Is King – We have all heard the saying “If it ain’t broke, don’t fix it,” but someone seemed to get a little too greedy by trying to save a few pennies on this product. Maybe Hershey should have looked harder at packaging or distribution costs and left the formulation alone. The key success factor of a food item is its taste. Don’t mess with my chocolate, please. 2) Differentiate or Die – We are smart marketers and don’t have to resort to copying our competition for market share. It’s important to give consumers a good reason to buy through an identifiable need, want, or desire. Sure, there may have been room for another product like M&M’s, but copycats seldom ever gain the necessary momentum to overtake the competition. Being different–for a good reason–is the smarter road to success. Sandstorm Inc. is an innovation firm specializing in the upfront insights and innovation process. Sandie Glass and Laura Wolfram bring a combined 34 years of experience in helping Fortune 500 companies like Procter & Gamble, Disney, Nike, American Express, GlaxoSmithKline and M&M/Mars tap into their creativity to achieve remarkable business solutions for market success.